Nozzle Dia. : 62mm. 1 x Garden Hose Nozzle. 1 x Expandable Garden Hose. The hose is wrapped with high-class fabric, both beautiful and wear-resistant. Connector material: copper. Expansion ratio: 1:3 Elastic resilience: 1.02. 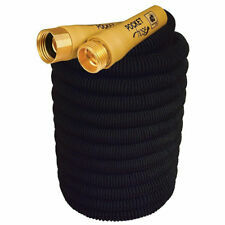 50' Pocket Hose Top Brass Bullet Flexible Water Hose w/ Spray Nozzle. The leak-proof flexible water hose is made with tight seal technology, making it even more flexible. It also has brass connector protectors on both ends to attach to any outdoor water faucet. Fast Free Ship From USA ! High Quality ! Good Warranty! This lightweight, expandable garden hose with exclusive Bullet Shell® outer casing has no seams to tear or burst, and stores easily without kinking. Lead-free connectors make it drinking-water safe. Includes free removable spray nozzle with three adjustable settings. ¾" (2cm) dia. x 25 feet long. 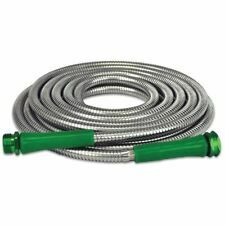 This 100' hose has a 4-ply reinforced construction with Water Guard Leak Free technology to eliminate leaks and wasteful watering. The scruff-resistant outer jacket with a flexible construction allows for effortless watering. Trending at $34.95eBay determines this price through a machine learned model of the product's sale prices within the last 90 days. 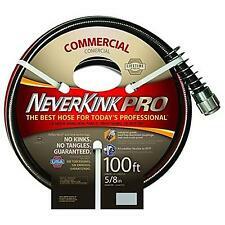 50' Pocket Hose Top Brass Bullet Flexible Water Hose w/ Spray Nozzle 6x Stronger. The leak-proof flexible water hose is made with tight seal technology, making it even more flexible. It also has brass connector protectors on both ends to attach to any outdoor water faucet. Get more yard work done with less effort with the As Seen on TV Water Hose Pocket Hose Ultra, Retractable 25 Feet Garden Hose. It is lightweight, portable and small enough to fit in the palm of your hand. New + Free FAST Shipping, Satisfaction Guaranteed! 75' Pocket Hose Top Brass Bullet Flexible Water Hose w/ Spray Nozzle Brand New!! Turn on the water to inflate into a full-sized super hose; turn off the water and watch it shrink back down to a lightweight pocket hose for easy storage. Thoughtful Design – The My Kaili garden hose was engineered with features to make your life easier and more convenient, including an 8 setting spray nozzle, super lightweight kink-free design, variable pressure switch, and on/off valve. Multifunction Expandable Garden Hose and Nozzle. Features: Expandable Garden Hose Garden Hose Nozzle 7 adjustable spray settings: flat, center, cone, full, mist, jet, and shower. 1 x Garden Hose Nozzle. Pocket Hose, the garden hose that's small enough to fit in your pocket, then expands automatically to a giant full sized hose. Water-powered Hose Rewind. Never twists or tangles like ordinary hose. 50-Feet length. Expandable Garden Hose. 1 x Expandable Garden Hose. Color: Green. Expanded Length: 100 ft. Quantity: 1. Covered with polyester fabric to protect inner tubing. The Wynnsky 3/8"×25FT rubber Air Hose,which is ideal for general purpose applications. It features a flexible, kink-resistant design. The rubber material is designed for long life and has a non-marring, abrasion-resistant cover. Get more yard work done with less effort with the As Seen on TV Water Hose Pocket Hose Ultra, Retractable 75 Feet Garden Hose. It is lightweight, portable and small enough to fit in the palm of your hand. 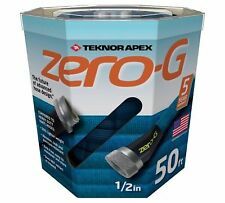 Zero-G, 50', Gray, Garden Hose, Lightweight, Kink-Free, Flexible, Strong Fiber Outer Sleeve, Flow Rate Equivalent To 5/8" Conventional Hose, Drinking Water Safe, Ergonomic, Crush Resistant Couplings, Patented Design For Easy Handling & Storage, 5 Year Warranty. Try out a durable and dependable garden hose for use in your yard with the Hercules Garden Hose. This premium As Seen On TV product is all you need for no-fuss watering of your lawn and garden. Despite the strong materials used in the 50 ft. hose, it's still a lightweight hose that's easy to carry around the back or front yard. 304 Stainless Steel Metal Garden Hose - 50ft. Garden hoses are invaluable pieces of lawn care equipment, keeping foliage healthy and hydrated. Their lightweight and durable design means you can usually expect for them to last a while before you need a replacement. Buying a new garden hose might seem simple on the surface, but there are many factors to consider, including what they're made of and what kind of accessories and attachments are compatible. What materials are most garden hoses made from? While some exceptions may apply (such as hoses made of metal or cloth), the majority of garden hoses are made from a form of plastic. In order to be used, the plastic chosen must be tested to be safe so that it won't leak any kind of harmful chemicals or residue into the water it transports. The most common plastic used in making the average garden hose is polyvinyl chloride, or PVC. What makes a heavy-duty garden hose heavy duty? What differentiates a heavy-duty garden hose from a light-duty or medium-duty hose is how it's constructed. The number of layers (plys) of plastic used in the construction of the hose is often what determines what "grade" it is. Light-duty hoses are typically three-ply, medium-duty hoses are four-ply, and heavy-duty hoses are five-ply or more. The thicker one is, the less likely it is to kink. It is also heavier due to the extra layers of material. Heavy hoses can be tricky to roll tightly and store in small places. What different kinds of garden hoses are available? Common Garden Hose: A common garden hose is what most people picture when thinking of a water hose. These hoses screw onto a tap and spray water from the tap out of the other end. Soaker Garden Hose: Soaker hoses are specially designed from porous materials that let water pass out of them at a slow rate. They are typically buried under the ground in a garden bed to continuously leak water onto the roots of plants. Sprinkler Garden Hose: A sprinkler hose is a filled with holes along one side of it, spraying moisture along the ground across its entire length rather than just at the end. It differs from a soaker hose in that water comes out at certain points of the hose in force, rather than seeping from the entire length of a soaker hose in a slow, drip fashion.